Sonia Delaunay was a Ukrainian-born French artist and designer known for her bold use of colorful geometric patterns. “For me, there is no gap between my painting and my so-called ‘decorative’ work,” she once observed. “I never considered the ‘minor arts’ to be artistically frustrating; on the contrary, it was an extension of my art.” During her early years in Paris, her paintings underwent a formal shift influenced by the vivid colors of Fauvism. It was Uhde that introduced her to her future husband Robert Delaunay. Having left Uhde for Delaunay, the new couple pioneered a fusion of Cubism and Neo-Impressionism, later deemed Orphism by the poet Guillaume Apollinaire. She used this new aesthetic approach to produce paintings, textiles, and designs over the course of her career. In 1964, Delaunay became the first living female artist to have a retrospective at the Louvre Museum. 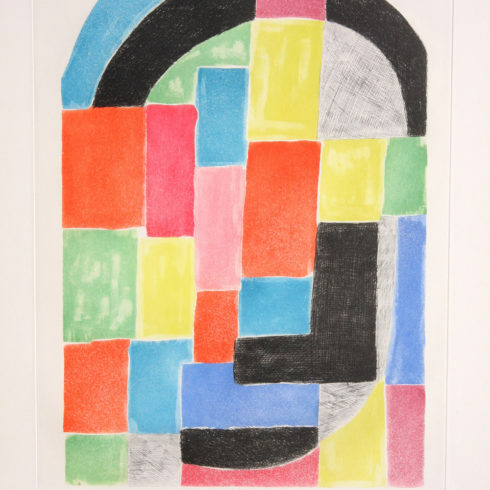 Our Fine Art Gallery has the finest quality Sonia Delaunay original prints, lithographs, and etchings. We encourage you to make an appointment to see specific works you are looking to collect. We are happy to meet you at either our art gallery showroom or at your home or office for a private presentation. Artist Sonia Delaunay-Terk was born in present-day Ukraine on November 14th, 1885 under the surname Stern. At a young age, Sonia Delaunay moved to St. Petersburg, where she was cared for by her mother’s brother, Henri Terk, a successful and affluent Jewish lawyer. Henri Terk and his wife Anna adopted Sonia Delaunay in 1890 when she assumed the name Sonia Terk. Sonia Delaunay-Terk received a privileged upbringing with the Terks, traveling widely throughout Europe where Sonia Delaunay was introduced to art museums and art galleries. When Sonia Delaunay was 18, she was sent to study art at the Academy of Fine Arts in Karlsruhe, Germany. Sonia Delaunay studied in at the Art Academy until 1905 when she decided to join the Modern Art Movement at Montparnasse in Paris. Sonia Delaunay was deeply influenced by the post-impressionist art of Van-Gogh, Gauguin, and Henri Rousseau as well as the artists of the Fauves group including Henri Matisse. During Sonia Delaunay’s first year in Paris, Sonia Delaunay met and married, German homosexual art gallery owner Wilhelm Uhde. It is assumed that Sonia Delaunay’s marriage to Uhde was a marriage of convenience to escape the demands of her parents, who disliked her artistic career. Through Uhde’s gallery Sonia Delaunay gained entrance into the Parisian art world and benefitted from his connections, and Uhde masked his homosexuality through his public marriage to Sonia. Through her connections, Sonia Delaunay met prominent artists of the modern art movement including: Pablo Picasso, Georges Braque, Georges Rouault, and Maurice de Vlaminck. Sonia Delaunay met painter Robert Delaunay in early 1909. Sonia and Robert became lovers in April of the same year and it was decided that Sonia Delaunay and Uhde should divorce. The divorce was finalized in August 1910. In November of 1910, Sonia and Robert Delaunay were married. Sonia Delaunay was pregnant with their son Charles who was born on January 18, 1911. Sonia Delaunay made a patchwork quilt for Charles’ crib, which is now in the collection of the Musee National d’Art Moderne in Paris. Sonia Delaunay’s quilt was created spontaneously and exemplifies Sonia Delaunay’s use of geometry and color in her textiles, paintings, and original prints. Contemporary art critics recognize this as the point where Sonia Delaunay moved away from perspective and naturalism in her art. Robert & Sonia Delaunay became associated with the development of Orphism, a highly abstract art movement which paralleled the geometry of Cubism but with a much brighter color palette. It is said that artist Paul Klee was so taken with Sonia Delaunay’s’ patterning of squares from a 1912 illustrated book, that they became an enduring feature in Klee’s own art. During the 1910-1920s, Sonia Delaunay focused on bringing this new artistic lyricism into the world of design, transforming Art Deco fabrics into vibrant high fashion clothing, wall coverings, furniture textiles as well as, theatrical costumes. In 1917 Sonia Delaunay met Sergei Diaghilev, and Sonia Delaunay designed costumes for his productions of Cleopatra and Aida. The Russian Revolution brought an end to the financial support Robert & Sonia Delaunay received from Sonia’s family in Russia, and a different source of income was needed. Sonia Delaunay made clothes for private clients and friends, and in 1923 created fifty fabric designs using geometrical shapes and bold colors, commissioned by a manufacturer from Lyon. Sonia Delaunay’s customers included Nancy Cunard, Gloria Swanson, Lucienne Bogaert and Gabrielle Dorziat. In the 1930s, Sonia Delaunay returned her focus on painting, joining the Abstraction-Creation group in seeking to create an art based upon non-representational elements, often geometrical, and continuing to focus on color as central to painting. The group was trans-national, and including among its members: Jean Arp, Barbara Hepworth, Wassily Kandinsky and Piet Mondrian. In 1937 Sonia & Robert Delaunay collaborated on a mural for the Exposition Internationale des Arts et Techniques dans la Vie Moderne. In 1941 Robert Delaunay died of cancer. After Robert’s death, Sonia Delaunay continued to work and exhibit regularly as a painter & designer, turning often to printmaking including: etchings, lithographs, and pochoirs prints. In 1963 Sonia Delaunay donated 58 of her own works and 40 of Robert Delaunay’s to the Musee National d’Art Moderne, Paris. Sonia Delaunay became the first woman ever to be exhibited at the Louvre during her lifetime when the museum mounted an exhibition of the works in 1964. In 1966 Sonia Delaunay printed Rythmes-Couleurs with 11 of her gouaches produced as pochoir prints, with texts by Jacques Damase. In 1969 Sonia Delaunay printed Robes poems, also with texts by Jacques Damase containing 27 Sonia Delaunay prints. Sonia Delaunay-Terk died in 1979 at the age of 94 with no regrets in her life. Sonia Delaunay’s work in modern design included the use of geometric abstraction in the integration of furniture, fabrics, wall coverings, clothing, prints, lithographs, and etchings.